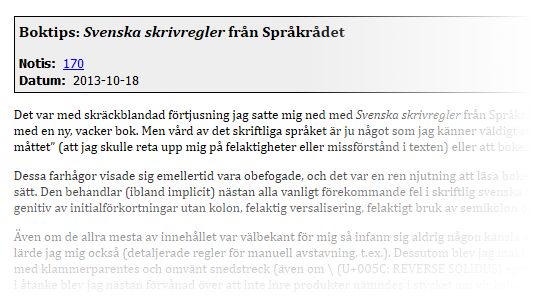 (This is from the Swedish site, so <html> has lang=sv.) Notice the use of the <time> element to mark up the date. Since the date string is already machine-readable (in one of the formats given in the HTML5 specification), there is no need for the datetime attribute. The CSS and the rendering is shown below. These articles are considered the standard ‘articles’ on my site, so there is no need for a class attribute on the <article> element. The rendering of this new semantic markup should match the original style of my guestbook, as shown in the following screenshot. This assumes that the parent indeed has black text on a white background, but this is the case if the default stylesheet is used, and alternate stylesheets are not supported in IE 7 and below anyway.